This entry was posted in post MARIA repairs, remains in Colihaut church, St. Peter's church in Colihaut on December 3, 2018 by Bernard Lauwyck. A few weeks ago I promised to let you know more about the first black priest in Dominica, Rev. Fr. George or Georges PADDINGTON. I did not get back to you earlier as I was waiting for a book named “STAMPED WITH THE IMAGE OF GOD, African Americans as God’s Image in Black” which I hoped would provide me with additional information . Was I disappointed with the paucity of information on him, when I received this otherwise very interesting book ! The authors describe Fr. Paddington as “ a very important historical figure in black Catholic history ” as “one of the first priests of African descent outside Africa”. They got access to his letters written in 1836 from Haiti to the Blessed Pierre Toussaint, an ex-slave in New York, who will be recognized as a black saint soon. These letters are stored on a microfilm in the New York Public Library. An interesting bit of information is that Fr. George came from an acrobat family in Ireland. Arthur Jones the author of “PIERRE TOUSSAINT, A BIOGRAPHY” refers several times to Fr. Paddington’s letters. He claims that these letters are extremely important for historians of black Catholicism. While I waited on the above mentioned book, I continued my research in French and English documents as I realised that I was breaking new ground with my own research on this black priest buried in Colihaut . What did I find out from different sources ? In 1836 Paddington wrote his letters from Haiti to Pierre Toussaint . He had gone to Haiti as an Irish seminarian and his command of French, a language he needed to minister in Haiti, was weak. He received both the minor and the major orders, and was ordained on 21 May 1836 in Port-au-Prince by an US Bishop named John England of the Diocese of Charleston, South Carolina. Most Rev. England, who at the time was Apostolic Delegate of Haiti, was originally from the same Irish Diocese as Paddington, which might have played a role in the selection of Fr. Paddington . Around 1839, George Paddington wrote that he was planning to go and finish his studies in Rome and France . Fr. Paddington is several times mentioned in “L’HISTOIRE RELIGIEUSE D’HAITI” , “LES MISSIONS CATHOLIQUES FRANÇAISES AU XIXE SIÈCLE/ MISSIONS D’AMÉRIQUE” and “HISTOIRE D’HAÏTI, VOL. 8”. In April 1843 Fr. Georges can be placed at “the College de la Propagande”, an international seminary in Rome, where he met Abbé Tisserand, a man who was determined to bring the gospel to the descendents of African slaves. Fr. Paddington returned to Haiti with Abbé Tisserand . “Abbé Georges Paddington, du diocèse de Kerry, en Irlande ” left Le Havre in France on the 3rd of February 1845 for Haiti on an oceanliner. They arrived at Jacmel in Haiti on the first of March 1845. “A few excellent Priests, for the greater part members of the Congregation of the Sacred Heart of Mary, instituted for the conversion of the negroes, were sent to Haiti, under the direction of l’Abbé Tisserand… The Haitian people then, at length, saw Priests full of zeal, disinterested, pure in morals, and who—strangers to the dissensions of party [politics]—limited their ambition to the saving of souls, to the enlightening of the ignorant, to succouring the poor and visiting the sick. Unhappily, the title of Prefect Apostolic, with which Tisserand had been invested by the Holy See… excited much opposition in Haiti, and the Government refused to acknowledge him. ” extract from THE TABLET archives of June 1846. As the situation in Haiti became untenable, due to the Haitian government’s restrictions on clergy, Fr. Paddington left and travelled to Trinidad, an island with many French colonists. In Dominica, Fr. George(s) Paddington was appointed parish priest of St. Peter’s in Colihaut . He mostly resided at Dublanc. Two years after his arrival in Dominica on August 28, 1849 , he became incapacitated by illness. He died and was buried in the shadow of the little parish church in Colihaut, built by his predecessor. 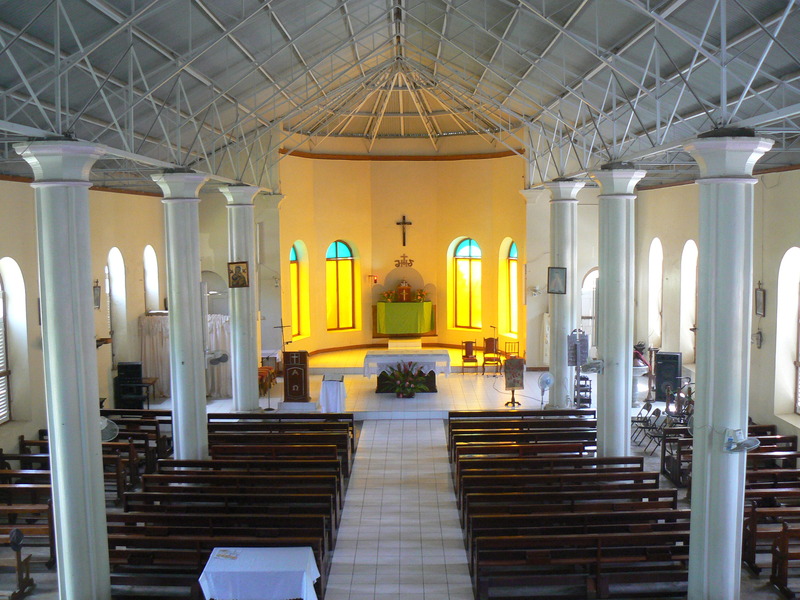 His remains were interred under the High Altar of the present St. Peter church in Colihaut, which was built in later years. Fr. Paddington came with excellent credentials : Abbé Tisserand, his superior called him a pious priest: “ le pieux abbé Georges Paddington”. Fr. George(s) Paddington, a saintly black priest, buried in the Colihaut church, was forgotten in Dominica up till now. 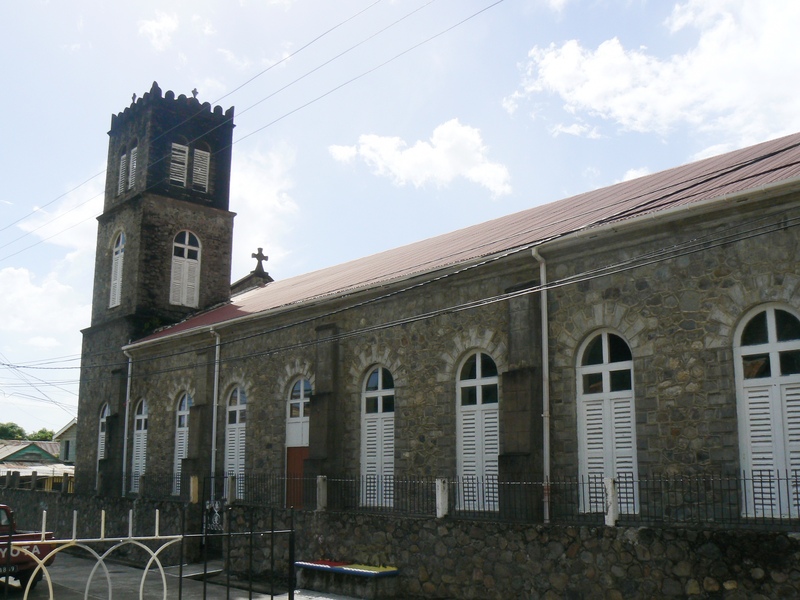 This entry was posted in First black priest in Dominica anno 1850, OLD CHURCHES and CHAPELS, remains in Colihaut church, St. Peter's church in Colihaut and tagged First black priest in Dominica anno 1850 on November 21, 2014 by Bernard Lauwyck. Fr. George Paddington, the first black priest in Dominica ? Recently I got an e mail from New Orleans asking me if I could find anything about a priest named George Paddington in the records of our Diocese. At first I did not find anything at all, but as my curiosity was kindled I dug deeper and discovered some exciting information. This information was published in November 1924 in the Ecclesiastical Bulletin of Roseau. Fr. George was undoubtedly the first black priest who served in Dominica. But then my doubts were raised. Was this really the same person or just a name sake? Was there a link between this priest from Port-Au Prince and our priest in Colihaut ? I needed independent attestation . I quote from his letter, dated 4 November 1849, written to Cardinal Fransoni, the Prefect of the Sacred Congregation of Propaganda Fide : “ Abbé Paddington has arrived here from Santo Domingo, about two months ago. I advised him to write to your Eminence to inform you of everything relating to the Mission of Haiti, and to await orders from your Eminence. I gave him a post on Dominica while he waits. I have just learned that he is doing much good, and that he is respected and esteemed. Bishop Smith was Vicar Apostolic of Port-of Spain from 1844 till he became Archbishop of Trinidad in 1850. Most importantly he was an Irishman as was Fr. Paddington. Remember that the first Bishop of Roseau (1850 -1855), Michael Monaghan, a colleague of Smith in Trinidad, was also Irish. I still wanted confirmation that Fr. Paddington was indeed a black priest and this I found confirmed in the diaries of his fellow traveller, yes another Irishman, on the boat from Trinidad to Dominica. Rev. Dr. John T Hynes (1799-1868) was a catholic bishop who travelled extensively, from his birth in Cork ,Ireland, through ordination in Kentucky, and worked in Cincinnati, Grenada, Demarara (= Guyana), etc. The DIARY OF JOHN THOMAS HYNES, 1843-1868 can be found on www.library.unisa.edu.au/condon/Hynes/index.htm. I quote from his entry of August 1849: “In the evening of the 20th.I arrived at Trinidad. Called immediately on Dr Smith, who accompanied me to see the Convent and College. August 20th. 7 p.m. Left Trinidad for Grenada – met on board Father Paddington, bound for Dominica. August 28. 6 a.m. off Dominica, where Fr. Paddington landed. Received from Fr. P. 20 gold pieces to be given to his sister in Cork. So far the dream of Bishop John Thomas Hynes in which he confirms that Paddington was a black priest. Having the link between Haiti and Dominica and the identity of Fr. George Paddington, parish priest of Colihaut for two years ( 1849-1851) confirmed , I cannot wait to present you with more information on the first black priest in Dominica. This entry was posted in First black priest in Dominica anno 1850, remains in Colihaut church, St. Peter's church in Colihaut and tagged Colihaut church, First black priest in Dominica, Fr. Georges Paddington on October 5, 2014 by Bernard Lauwyck.